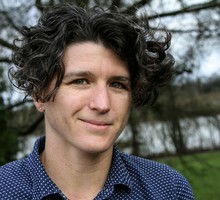 Sage Van Wing is the executive producer of Oregon Public Broadcasting's daily talk show, "Think Out Loud." She has produced daily news programs at other NPR affiliate stations Vermont Public Radio, KUOW in Seattle and KQED in San Francisco. She graduated from Stanford University with a degree in anthropology. While in Vermont, she became an expert sledder. While in Seattle, she learned to bike in the rain. Sage hopes someday to become an expert taxidermist. The Blazers head to the semifinals. Can class action lawsuits actually improve child welfare? And we talk to two people who survived genocide about what we can learn from their experiences. A scientist from Newport just returned from an international research effort studying salmon in the Pacific. Also, crabs have been found feeding at methane seeps in the deep ocean. And we'll listen back to an interview with peer support specialists. Who are Oregon's cannabis consumers? Also, officials are working to make sure immigrants and communities of color aren't left out of the census. And a team of researchers heads to Antarctica for the winter. Little Big Burger workers have unionized. A new bill would punish age discrimination. One public library offers access to court records. And students have been physically restrained without their parents' knowledge. Legendary Oregon author Barry Lopez's new book is "Horizon."